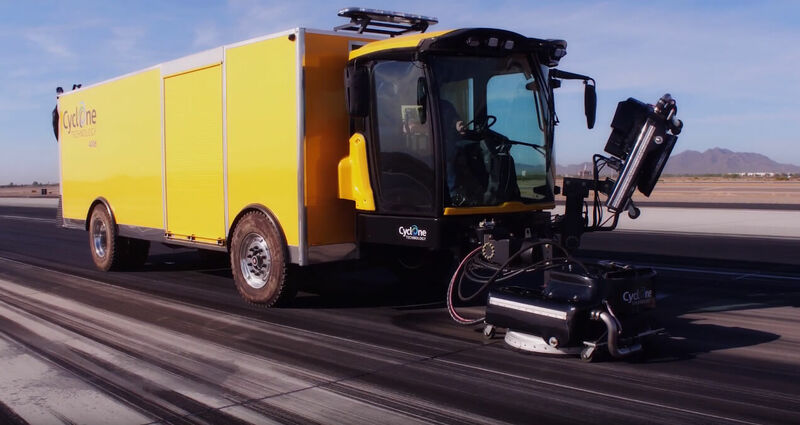 This ultra-high pressure cleaning vehicle is designed specifically for removing rubber and paint from airport runways. Its specially shaped turbine blades create a vortex (cyclone!) of air, water, and loosened rubber or paint at 140 mph. 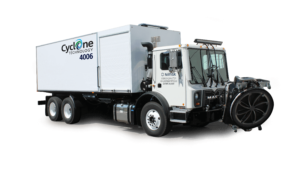 A high-volume macerator pump further emulsifies the recovered waste water into a large 1,000 gallon waste recovery tank near the rear of the vehicle. It’s also able to dump solid waste material separately from waste water with the press of a button. Reclaim Tank Sand blasted and powder coated stainless steel. (Available in carbon or stainless steel). Separates water from material. 2,100gal. Chassis 10in. (0.25m) x 3in. (0.08m) x ¼in. (0.0064m) wall cold rolled steel tubing frame on a 23,000lb. (10,433kg) rear axle and a 20,000lb. Cleaning Head Assembly Removable, joystick controlled, multi-pivot point maneuverability. Cast aluminum housings, hydraulically driven rotation, fiberglass recovery tank. Belt-driven return pump. Each head max work pressure is 40,000 psi (2,700 bar) at 6 gpm (21L/min) Each head has a separate return tank and filtration screen. 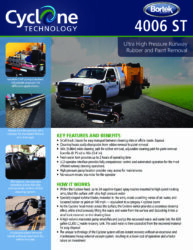 Cleaning Attachment Gas powered, remote paint removal head operates up to 300ft. (91m) distance from the main unit. Small truck chassis for easy transport between cleaning sites or offsite waste disposal. Cleaning heads easily changeable from rubber removal to paint removal. 34in (0.86 m) wide cleaning path for rubber removal, adjustable cleaning path for paint removal from 6in (0.15 m) to 16in (0.41m). Fresh water tank provides up to 2 hours of operating time. 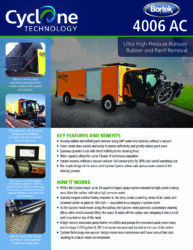 LCD operator interface provides fully computerized control and automated operation for the most efficient runway cleaning operations. Cleaning Head Assembly Permanently mounted, joystick controlled, multi-pivot point maneuverability. Cast aluminum housing, hydraulically driven rotation, fiberglass recovery tank. Belt-driven return pump. 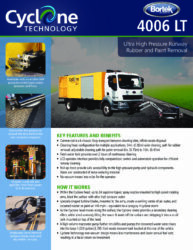 Rubber or Paint removal head max work pressure is 43,500psi (2,700bar) at 6gpm (21L/min). Can easily be changed from Paint to Rubber removal in minutes. 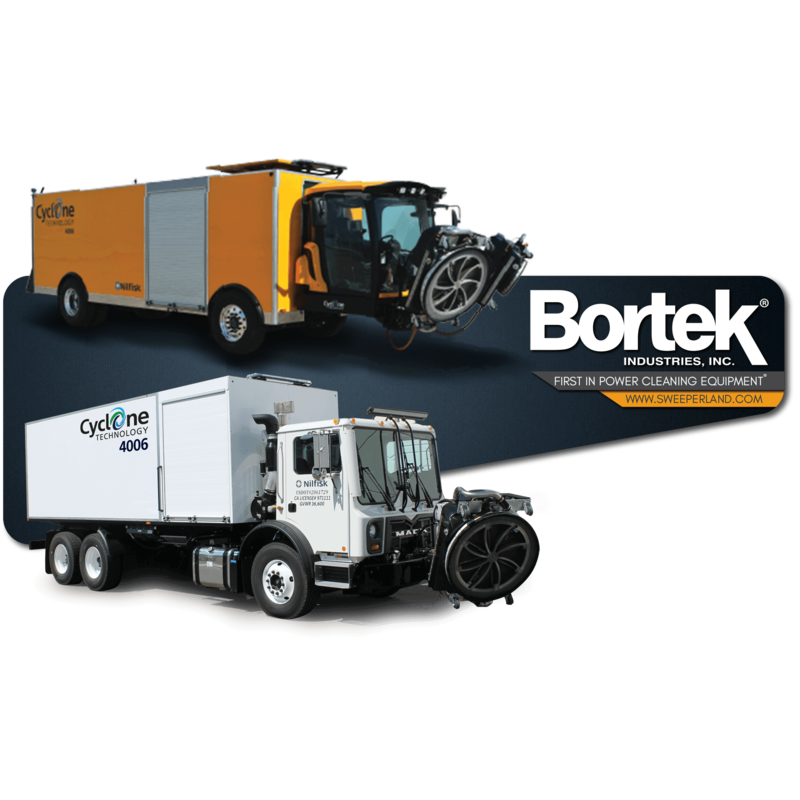 Cleaning Attachment Gas powered, remote paint removal head operates up to 300ft (91m) distance from the main vehicle. Rubber Removal Head (1)40in (1.01m) cast aluminum head, with up to 34in (0.86m) cleaning path. Hydraulically actuated with a multi-axis arm, joystick-controlled by the operator. Fresh Water Tank Capacity: 530gal (2,081L) internally baffled, constructed of corrosion resistant fiberglass. Reclaim Tank Separates water from material. 600gal (2,271L) total capacity. Powered dump with powered door for easy maintenance. Available in carbon or stainless steel. Operating System Hydraulic creep drive. Independent cooling/radiator, package. Travel in drive or hydrostatic mode. Standard Cyclone system for rubber and paint removal incorporated onto a smaller truck. 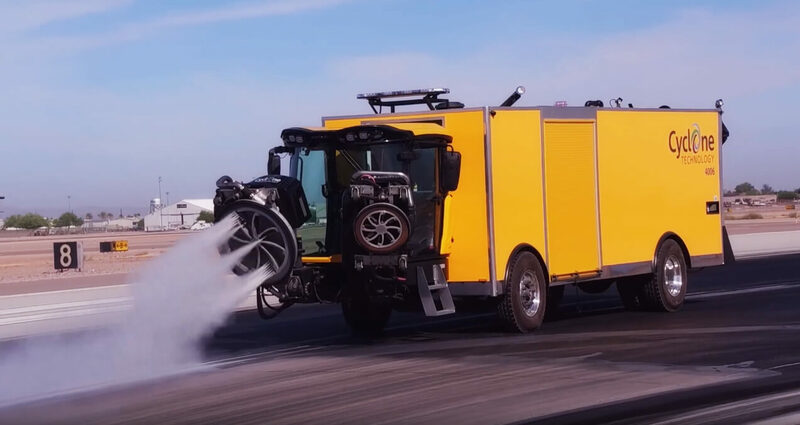 Truck chassis allows for transport speeds up to 65 mph/h. 800 gallon of fresh water for up to 3 hours of continuous operation. 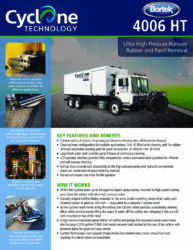 Lowest water consumption in the industry, less than 6.07 gallon/min. 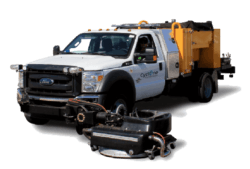 Cleaning Head Assembly Permanently mounted, hydraulically controlled, multi-pivot point maneuverability. Cast aluminum housings, hydraulically driven rotation, fiberglass recovery tank. Belt-driven return pump. Each head max work pressure is 40,000 psi (2,700 bar) at 6gpm (21L/min) Each head has a separate return tank and filtration screen. The spin of the Cyclone head creates vacuum like recovery*.